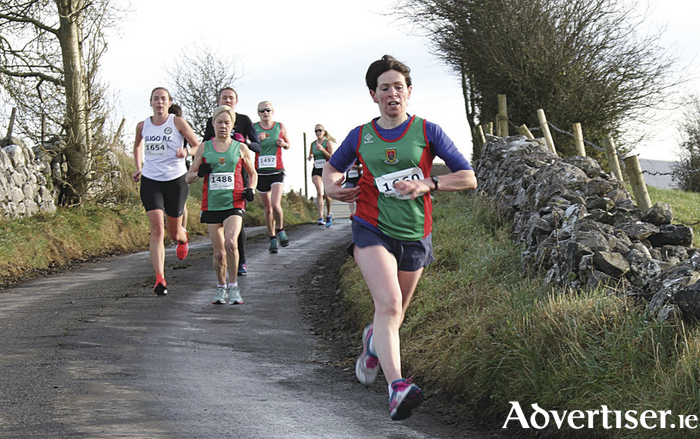 Noreen McManamon (Mayo AC) leads a group during the first lap of the women's 6k race at Hollymount Road Races. The familiar setting of Hollymount’s main street was the backdrop to the traditional November road race on Sunday afternoon. Bib numbers were collected at the community centre. Warm-ups along the local arteries got the blood going ahead of the task – lungs and legs engaged and put through their gears. The Reilly family have been a constant presence at the centre of this popular annual event. Seán Reilly was there again on the start line to lead the organising team of the 51st running, which takes place around the familiar 3k lap. The weather was kind, mistily serene but chilly – a welcome contrast to the wind and floods of last year’s 50th running. The event also served as the final race in Mayo AC 2016 Vodafone C&C Cellular Club League with women and men members competing for points and prizes. Last year’s winner Matt Bidwell led home again – a clear winner in 33:15, slightly down on his 32:35 2015 finish. Mayo AC's John Byrne chased him all the way for second in 33:59, while regular visitor and consistent Hollymount performer Alan Ashton (Liverpool Harriers AC ) was third in 34:25. Mayo AC won the team prize with John Byrne ably supported by Anto Devaney, Patrick Walsh, and Neil Carroll. Catherine Conway showed great form, leading the field home in the women’s 6k in 23:05. Colette Tuohy was 40 seconds behind in second, and with Sarah Syron 24:36 in third, these three ensured Mayo AC a clean sweep as they combined to win the team prize. The event was well supported by local clubs as well as the traditional entourage from John Moore's University and Liverpool environs – 18 of them competed. Like all those competing they acknowledged Tom Reilly’s role in the history of the event and gave his statue a special wave as they passed by on the Kilrush corner of the circuit. Women 6k: First Catherine Conway 23:05; second Colette Tuohy W40 23:43; third Sarah Syron 24:36. All Mayo AC. W40 Angela McVann (Mayo AC ) 27:54; W50 Michelle Murphy (Liverpool Harriers AC ) 26:31; W60 Pauline Moran (Mayo AC ) 25:40. Men 10k: First Matt Bidwell (GCH ) M40 33:15; second John Byrne (Mayo AC ) M40 33:59; third Alan Ashton (Liverpool Harriers ) M40 35:47; M40 Sean Burke (Tuam AC ) 36:12; M50 Paul Fallon 40:59; M60 Tom Hunt (Mayo AC ) 43:49.